Biosolids are the organic materials generated by treatment of sludge, the name for solid, semisolid, and liquid residue created during the processing of domestic sewage by a treatment facility. An article on Wikipedia has information about Biosolids in areas beyond Albemarle County's borders. The use and distribution of biosolids in Albemarle County has been regulated by the Virginia Department of Environmental Quality (DEQ) since 2007. Companies issued permits must present a strategy to the DEQ that ensures phosphorous and nitrogen do not enter the watershed and the recipients of the biosolids receive limits on agricultural activity following the application of the sludge. The permits, which cost companies $5,000 plus a yearly maintenance fee of $1,231, require that the sludge be tilled into the ground within 24 hours of application and forbids livestock from grazing on the land for 30 days. The Virginia Department of Environmental Quality states that 12,718 dry tons of biosolids were applied in Albemarle County between January 2008 and May 2010 however, within this time period, no biosolids were applied between August 2008 and March 2009 or between December 2009 and May 2010. 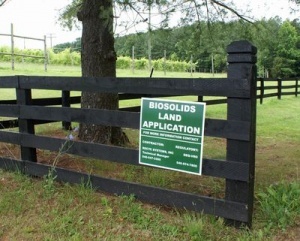 In 2011, the Charlottesville Regional Chamber of Commerce passed a resolution supporting the regulated use of biosolids as fertilizer in the county. Since 2001, the Remington-based company, ReCyc Systems, has held permits allowing the distribution of biosolids in Albemarle County. The company is paid by the waste treatment facility that produces the sludge and delivers it to landowner, who uses it as fertilizer, free of charge. Although the permit issued to the company by the DEQ requires that localities be notified 100 days prior to application, ReCyc Systems has been cited on more than one occasion for failure to do so. In 2012, ReCyc Systems' permit allowed the application of sludge on a maximum of 6,907 acres in Albemarle County. ReCyc Systems has also applied to modify their permit to add 114 additional acres to their current permit. The majority of the sludge in the county comes from DC's Blue Plains Wastewater Treatment Plant and undergoes several treatments to reduce pathogens, including adding lime to raise the level of the sludge's pH. Blue Plains Wastewater Treatment Plant handles raw sewage from the D.C. metro area, as well as Montgomery and Prince George's Counties in Maryland and Fairfax and Loudoun Counties in Virginia. Synagro is a nationally-based organization that is also permitted to spread biosolids in Albemarle County. As of 2012, Synagro's permit allows the company to spread fertilizer on a maximum of 170.9 acres in Albemarle County. Currently, local government is prohibited by state law from regulating the use of biosolids in their areas. In January, 2012, legislation was introduced to the General Assembly by Del. C. Todd Gilbert that would authorize individual localities to prohibit the use of biosolids. As of February 12, 2012 the bill was tabled until 2013 and is unlikely to pass. ↑ Web. Water: Sewage Sludge (Biosolids), United States Environmental Protection Agency, retrieved June 20, 2012. ↑ 2.0 2.1 Web. Landowners concerned about dumping of D.C. sewage in Albemarle, Sean Tubbs, Charlottesville Tomorrow, January 31, 2011, retrieved June 20, 2012. ↑ Web. Albemarle Supervisors briefed on state biosolids rules, Sean Tubbs, Charlottesville Tomorrow, July 7, 2011, retrieved June 21, 2012. ↑ 4.0 4.1 Web. Mallek seeks increased scrutiny of biosolids; Recyc seeks to apply treated sewage on more acreage, Sean Tubbs, Charlottesville Tomorrow, June 28, 2011, retrieved June 21, 2012. ↑ Web. County of Albemarle Executive Summary, Albemarle County, 6 July 2011, retrieved 18 July 2012. ↑ 6.0 6.1 6.2 Web. As biosolids applications begin, practice still has champions and detractors, Ian M. Lamb, Charlottesville Tomorrow, July 2, 2011, retrieved July 2, 2012. ↑ Web. Biosolids legislation not likely in coming General Assembly session, Sean Tubbs & Kurt Walters, Charlottesville Tomorrow, December 21, 2011, retrieved June 21, 2012. ↑ Web. Biosolids Management Program, District of Columbia Water and Sewer Authority, retrieved June 21, 2012. This page was last edited on 27 August 2012, at 16:21.